Front-page of The Sun from Saturday 11 April 1992. 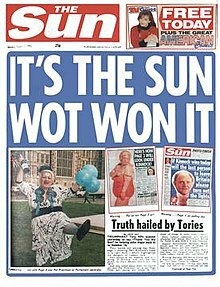 "It's The Sun Wot Won It" is a headline that appeared on the front-page of United Kingdom newspaper The Sun on 11 April 1992. It is regularly cited in debates on the influence of the press over politicians and election results and has since become a political catch phrase in the UK. The headline referred to The Sun's contribution to the unexpected Conservative victory in the 1992 general election. Owned by Australian media mogul Rupert Murdoch, The Sun had been relentless in its drive to turn voters against the Labour Party leader, Neil Kinnock. The Sun – at the time, the tabloid newspaper with the widest circulation in Britain – encouraged its readers to back the Conservatives, and published the election day headline, "If Kinnock wins today will the last person to leave Britain please turn out the lights." The "lights" headline was an apparent paraphrase of a slogan used by one of Murdoch's newspapers during the 1975 Australian federal election. The Conservative government's 21-seat majority gained in the 1992 election represented a large fall from the 102-seat majority achieved at the previous election five years earlier, but the opinion polls in the run-up to the 1992 general election had made it appear that a hung parliament or a narrow Labour majority was the most likely result. Kinnock himself blamed The Sun and other newspapers sympathetic towards the Conservatives as a major factor in his failure to win the election, bitterly denouncing its use of "misinformation and disinformation". Even some Tories acknowledged that The Sun contributed to their election triumph, including Margaret Thatcher and Lord McAlpine. A 1994 report in The Independent claimed that The Sun had little effect on the Conservatives getting a larger vote share, and said it was more likely that people thought John Major (who had taken office in November 1990) was a stronger leader than Kinnock, who was being over-confident of winning. Variations of the headline are frequently used in the UK media during elections. The phrase was used again by many political commentators after the 1997 general election when The Sun switched sides and supported Labour's new leader Tony Blair, who won the election by a landslide. However, unlike in 1992, opinion polls for most of the inter-election period had consistently suggested that a Labour victory was likely. In 2004, it was said to be The Guardian "wot lost it" for John Kerry in the US presidential election: after the newspaper started a letter writing campaign to voters in Ohio urging them to vote for Kerry, the state went for George W. Bush. In the 2008 London Mayoral election, it was supposedly the Evening Standard 'wot won it' for Boris Johnson. Also in 2008 The Sun used a variation of the headline for a debate at the Oxford Union over the Page 3 girl claiming 'It's Sun's girls wot won it'. In a 2008 special pull-out section about green energy, an altered version of the anti-Kinnock headline appeared in The Sun featuring Labour prime minister Gordon Brown and the words "Will the last person in Britain to switch to energy-saving bulbs please turn out the old lights" next to an image of Brown's head in a lightbulb. The headline "will the last person to leave Britain please turn out the lights" was paraphrased during the News International phone hacking scandal to refer to the closure of the News of the World in July 2011 - a decision made by newspaper owner Rupert Murdoch in a response to the inevitable loss of advertisers and readers that the phonehacking scandal was expected to cause the newspaper. In April 2012, giving evidence to the Leveson Inquiry, News Corporation chairman Rupert Murdoch described the Sun Wot Won It headline as "tasteless and wrong" and reported giving the then-Sun editor Kelvin MacKenzie "a hell of a bollocking." ^ a b Ben Dowell (25 April 2012). "Rupert Murdoch: 'Sun wot won it' headline was tasteless and wrong". Guardian newspapers. Retrieved 25 April 2015. ^ J. Curtice (September 1999). "Was it the Sun wot won it again? The influence of newspapers in the 1997 election campaign" (pdf). Centre for Research into Elections and Social Trends. Retrieved 4 May 2008. ^ Douglas, Torin (14 September 2004). "Forty years of The Sun". BBC News. Retrieved 4 May 2008. ^ a b c Thomas, p. 1. ^ Douglas, Torin (21 April 2005). "Could it be the Sun wot wins it again?". BBC News. Retrieved 4 May 2008. ^ "Exclusive: How did Labour lose in '92? : The most authoritative study of the last general election is published tomorrow. Here, its authors present their conclusions and explode the myths about the greatest upset since 1945". The Independent. 28 May 1994. Retrieved 25 May 2017. ^ Ian Burrell (8 November 2004). "Lady Antonia of Clark County". London: The Independent. Retrieved 4 May 2008. ^ Tim Luckhurst (4 May 2008). "So was it the 'Standard' wot won it?". London: The Independent. Retrieved 4 May 2008. ^ "It's Sun's girls wot won it". The Sun. 25 April 2008. Retrieved 4 May 2008. ^ Purves, Libby (30 April 2008). "The Sun shines bright at the Oxford Union's Page 3 girl debate". Times Online. London. Retrieved 4 May 2008. ^ Wells, Matt (15 July 2011). "Les Hinton sacrificed, but the worst is yet to come for News Corp". The Guardian. Guardian Media Group. Retrieved 19 July 2011. Thomas, James (2007). Popular Newspapers, the Labour Party and British Politics. New York: Routledge. ISBN 9781135773731. This page was last edited on 14 March 2019, at 18:44 (UTC).